You’ve heard about it in other audio programs, you’ve read about it in business and personal development books, and you’ve heard countless people refer to the pesky “Pareto Principle” and how it greatly affects our lives – but do you actually know how it works? By concentrating on the few things that do matter, we can unlock the enormous potential of the central 20 percent and multiply our happiness and fulfillment. Secrets of the 80/20 Principle Revealed! Find your “critical 20%” and transform your time — and life — forever! 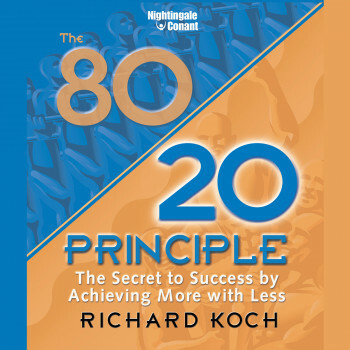 The 80/20 Principle — also known as the Pareto principle — is the well-verified observation that in business, economics, and life generally, about 80 percent of all results flow from a mere 20 percent of our efforts. The unspoken corollary of the The 80/20 Principle is that little of what you spend your time on actually enriches your life. But by concentrating instead on the few things that do matter, you can unlock the enormous potential of the critical 20 percent and multiply your happiness and fulfillment. When you learn how to systematically apply The 80/20 Principle, you will finally have the power to transcend the pressures of modern life: to become more successful AND to enjoy more leisure, serenity, and great relationships with friends and loved ones.